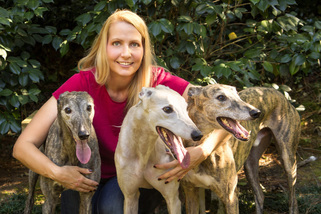 ​For over 20 years Kathy has been training dogs and training Greyhounds since 2001. She volunteers with both Southeastern Greyhound Adoption and Second Chance Greyhounds. She is a Certified Dog Trainer and Professional member of the International Association of Canine Professionals and is trained in pet first aid. Her first Greyhound, Amanda adopted from Southeastern Greyhound Adoption had severe separation anxiety to the point that she nearly returned her back to the group. Having dealt with and conquered this behavior in her own dog, she has a special affinity and compassion for those dealing with SA in their Greyhound. It can be both very stressful and heartbreaking.